123 by 41 by 55 in. 312.4 by 104.1 by 139.7 cm. 72 by 192 by 144 in. 182.9 by 487.7 by 365.8 cm. 70 3/4 by 108 by 72 in. 179.7 by 274.3 by 182.9 cm. New York, February 14, 2003 – Mitchell-Innes & Nash is pleased to present an exhibition of bronzes by George Segal (1924-2000). 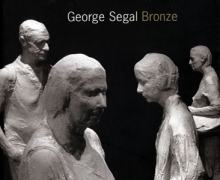 George Segal: Bronze will be on view from April 23 through june 14, 2003. This will be the first solo exhibition of Segal’s work in a New York gallery since 1998 and the first ever gallery show to focus exclusively on his bronzes. Among the bronzes on view will be three large-scale, multi-figure works: “The Dancers” (1971), “Chance Meeting” (1989) and “Woman in Armchair,” (1994). The exhibition is presented in conjunction with The George and Helen Segal Foundation and Carroll Janis, Inc. George Segal first began making plaster casts from live models in 1961 and was known throughout his career for his figurative sculptures in plaster. He began working in bronze in 1971, using a technique known as “double casting” to reproduce the details of his life casts in a material that could withstand outdoor installation. “The Dancers,” one of Segal’s first sculptures in bronze, was conceived as a model in 1971, and cast in an edition of five in 1983. The work depicts four female figures in a circle and is reminiscent of works by Degas and Matisse. A bronze cast of “The Dancers” is in the permanent collection of the National Gallery of Art, Washington, DC. "Chance Meeting" depicts one man and two women standing on a street corner, under two “One Way” signs and illustrates Segal’s keen observation of everyday city life. The work pairs sculpted figures with found objects, a feature of many of Segal’s sculptures. Likewise, in “Woman in Armchair,” Segal’s model sits in a pre-existing chair, blurring the boundaries between sculpture and surroundings and demystifying the art object. Mitchell-Innes & Nash will exhibit another important Segal work this spring. Segal’s seven-figure "Street Crossing" (1992) will be the keynote installation of Art Unlimited at Art Basel, June 18 – 23, 2003. George Segal is represented in more than 150 public collections worldwide. He is known for his many public memorials, including “The Holocaust” in the Legion of Honor Park, San Francisco, and “Gay Liberation,” at Sheridan Square in Greenwich Village, New York City. Segal is currently the subject of an exhibition in New Jersey at Rutgers University’s Jane Voorhees Zimmerli Art Museum. Prior to its presentation at Rutgers, the major 2002 retrospective George Segal: Sculptures, Paintings and Drawings from the Artist’s Studio traveled throughout Japan and to the Hermitage in Russia. George Segal: Bronze will be accompanied by an illustrated catalogue with an essay by artist Charles Ray and Joan Pachner, a curator at Storm King Art Center. Gallery hours are 10:00am to 5:00pm, Tuesday through Saturday. To preview the exhibition or for further information, please visit the gallery website at www.miandn.com or contact Robert Grosman at the gallery at (212) 744-7400. For press information, please contact: Stacy Bolton at (212) 721-5350 or sbstul@aol.com.